CPP Carries Mighty Industrial Strength Pumps to accommodate all your needs. Mighty Jet-Prime Pumps are Centrifugal Trash and Slurry Pumps with continuous dry running and automatic priming. These pumps are the industry’s leader in efficiency and are built with massive trailers and skids. Mighty Jet-Prime Pumps are powered by diesel or electric engines and are available in fifteen models from four inch to twenty-four inch. Mighty Hydraulic submersible pumps are a way to separate the pump from the engine allowing for pumping higher viscosities and permitting pumping from depths of down to 450 ft. 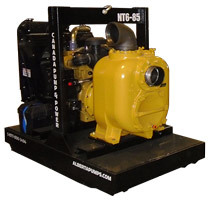 These pumps are powered by hydraulic power packs driven by diesel or electric engines. Mighty Pumps sells self-priming diesel trash pumps called Naked Pumps. These units require water over the impeller to prime, but they are truly “naked pumps”, with only one moving part – the impeller. These pumps are built tough for mine and industrial use. 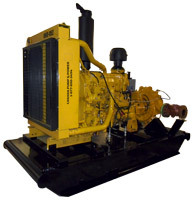 Naked Pumps are powered by diesel or electric engines. Mighty Pumps rents and sells submersible pumps for dewatering, handling solids, pumping slurries and even agitator pumps capable of dredging. We have small diameter pumps that fit into tight places. We have pumps with explosion-proof ratings for operating in hazardous environments.